Just two roster notes today as things become a bit more settled on the system-wide defense. With Roman Polak back to health and no Dallas games until Friday, Dallas has returned Ben Gleason to the Texas Stars. He played in two games while in Dallas and picked up his first NHL point in his first NHL game on Saturday. Ondrej Vala was sent back to Idaho yesterday in anticipation of the move. If Dallas still needs someone on Friday, all signs indicate Gavin Bayreuther would be the most likely callup. In the meantime, Texas has a game tomorrow against Manitoba at home. Dallas Stars General Manager Jim Nill announced today that the club has reassigned defenseman Ben Gleason to the Texas Stars, Dallas' top development affiliate in the American Hockey League (AHL). Gleason, 20, recorded one assist (0-1=1) in two NHL contests with Dallas. Gleason has registered six points (2-4=6) in 11 AHL games this season with Texas. He is tied for first among Texas defensemen in both goals (2) and points (6). The 6-foot-1, 185-pound native of Ortonville, Michigan was originally undrafted and signed with Dallas as a free agent on Sept. 13, 2018. Gleason has recorded 125 points (22-103=125) in 236 career regular-season OHL games with the Hamilton Bulldogs and London Knights. 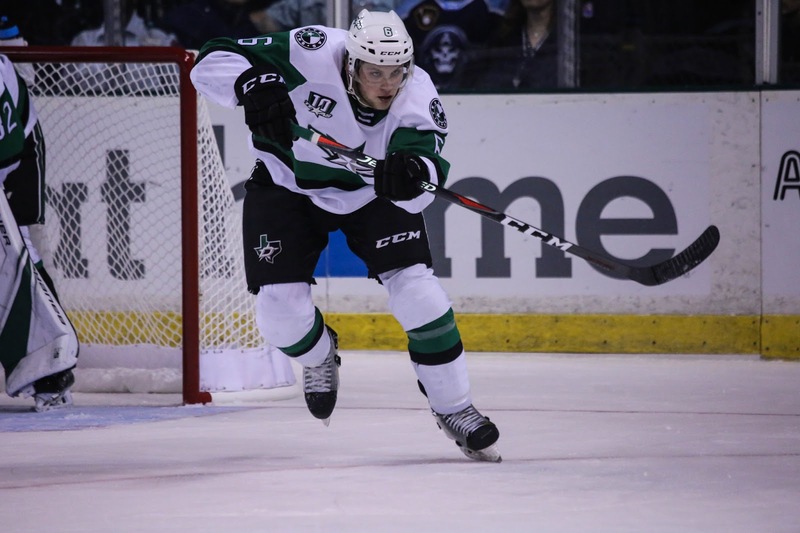 The Texas Stars, American Hockey League affiliate of the NHL’s Dallas Stars, announced today that defenseman Ondrej Vala has been reassigned by Dallas to the club’s ECHL affiliate, the Idaho Steelheads. Vala, 20, began the season with the Steelheads after skating in a pair of preseason games with the Stars. The blue liner earned his first ECHL point, an assist, two penalty minutes and a plus two rating in six games of action. Vala has played two games with the Stars this season and recorded two shots. The Czech Republic native made his AHL Debut two seasons ago, tallying an assist in three games with Texas. The WHL product played 191 games in junior hockey from 2015 to 2018 and recorded 74 points (21-53=74) with Kamloops and Everett.